Confession #1: Yes, I read this book because it had my name in the title. I had no idea what it might be about, but I just had to check it out. Confession #2: I liked it! 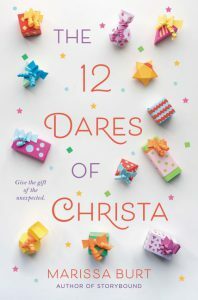 The 12 Dares of Christa is the most recent YA novel by Marissa Burt. It’s a funny, sad, heartwarming story of a teen girl working through a difficult, confusing time in her life. Christa is a huge fan of the holidays, and each year the planning starts months in advance. She loves to come up with a crazy agenda of activities for her and her parents. This year is different though. Instead of being at home for Christmas, they are going on vacation to Europe! Two weeks traveling to Florence, Paris, and London. It won’t be the same as being at home, but it will be fun. But, before the trip, her parents break the news that they are planning to divorce. Christa is devastated of course. She will be taking the trip only with her mother. Her father will be staying home in Chicago. Definitely not the vacation Christa was looking forward to. However, once she arrives in Italy, she finds a package from her father waiting in her hotel room. He has arranged his traditional holiday scavenger hunt for her. Even though he can’t be with her, he has set up 12 dares that she has to complete as she is traveling through Europe. I found the dares fun, mostly. A bit repetitive, but with a good purpose in the end. And, it was their father/daughter tradition after all. Christa makes some new friends and does learn more about herself, gaining much more strength and confidence than she had at the beginning of the book. I think this would be a good read for YA fans who like the holidays, European travel, and surprises. This entry was posted in Books & Reading, Youth Services and tagged #FridayReads, Friday Reads. Bookmark the permalink.